One of the starting points for understanding macroeconomics is to understand basic measures of the economy and what we call the “circular flow” of goods and services. 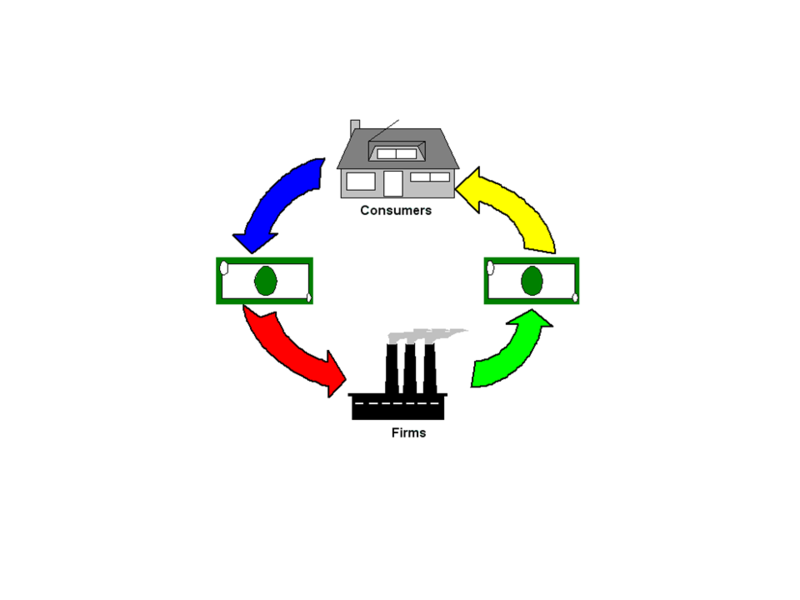 The “circular flow” refers to the idea that firms are the economic “agents” who produce and sell all our goods and services for sale, and that households are the folks who consume those goods. Of course in reality, both groups are made up of the same people, but we divide up the activities into firms and household consumption. Given this division of activities into two groups, the circular flow is the idea that the groups both buy and sell to each other. Households buy the products sold by firms, but households also sell their labor to the firms. This is all good and it shows how interdependent firms and households are. Firms can’t hire and pay if they don’t sell products, but households can’t buy those products unless they are able to sell their labor to the firms. We generally measure the size of an economy by adding up the total value of all the goods and services that are produced and then sold. This is what we call GDP – Gross Domestic Product. GDP is the accepted way to measure the size of an economy. The GDP number as observed and estimated each period is what should technically be called Nominal GDP. It’s the starting point for estimating Real GDP. Real GDP is GDP adjusted for changes in the overall level of prices – it takes the inflation/deflation out of the GDP numbers so we can compare GDP from different time periods. The GDP numbers as reported by the government agencies is generally computed by observing and at times estimating how much spending happened. In other words, it’s an attempt to add up the value of all final sales by firms of the products they produced. A “final” sale means the product has been sold to someone who intends to use it up or consume it as opposed to reselling it or making it into an even better product. There is however another way to estimate GDP. Since the total value of what firms produce is the money the firms receive, then we could look at how that money is disposed of by those firms. Put in other words, instead of looking at what households spend to buy goods and services, we can look at the income households received. We could look at the other side of the circular flow. When calculated this way, we give it a slightly different name: Gross Domestic Income or GDI. Because of the circular flow, the two sides shoudl be the same. In other words, in theory GDP should equal GDI. In general and over the long haul they do. Of course theory and practice sometimes differ. On a quarter-by-quarter basis, GDI and GDP differ slightly because of difficulties in measuring precisely – what we call statistical discrepancy. Occasionally the discrepancy is bigger than other times for reasons economists don’t fully understand. The first half of 2011 was one of those periods. So was 2007. But as you can see from this graph (thanks to James Hamilton at Econbrowser), in general GDP does equal GDI. I came here following a link Clonal left me, to your recent Mean and Median post. The GDI alternative to GDP strikes me as very interesting because it should break income down into factor costs in a highly visible way. I ran across GDI one time before, couple months back. But I did not find the numbers presented in a way I could confidently understand — not like GDP numbers are presented. Wondering if you know of a good source for the GDI numbers. Thanks.